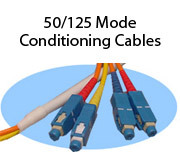 Stonewall offers mode conditioning patch cables for 1000BASE-LX gigabit ethernet applications. Available with ST, SC, MT-RJ, and LC connectors in any length you need! We manufacture many fiber optic cable products that are not yet available for online purchase. If you don't see the fiber optic cable product you need, please call 800-525-3303 or e-mail us for assistance. Note: Mode is a single electromagnetic field pattern that travels in fiber. Singlemode is an optical fiber with a small core (2-9 microns) that supports one mode. The core/cladding size (e.g. 8.3/125) is stamped on the cable jacket, which is traditionally yellow. Singlemode is commonly used for high speed, long distance links. Multimode is an optical fiber with a core (25-200 microns) that supports several modes. The core/cladding size, commonly 62.5/125 or 50/125, is stamped on the cable jacket which is traditionally orange. Check equipment requirements or cable jacket to determine which core/cladding size you need. Multimode is used for lower speed, short distance links. 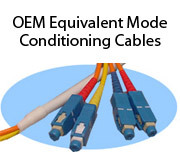 Mode Conditioning is specific to Gigabit Ethernet applications. It eliminates multiple signals caused by differential mode delay effects, which would otherwise limit the cable distance lengths. 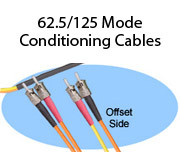 Singlemode, multimode, or mode conditioning cables are not interchangeable; if unsure check equipment requirements. Simplex cable has a single fiber. Duplex cable has two fibers usually in zipcord (side by side) style. Multistrand cable has two or more fibers in a round jacket. Commonly used connectors are ST, SC, LC, MT-RJ, FC, ESCON, and FDDI (MIC). Others are available. Available jacket types are OFNR (PVC) Riser, OFNP Plenum, Indoor/Outdoor Riser, Indoor/Outdoor Plenum, Aerial (Self-supporting), and Direct Burial. Plenum requirements are determined by local fire codes. Short runs within a single room usually use a general purpose OFNR rated jacket. Longer runs through air ducts, and other air handling spaces usually require a plenum rated jacket. 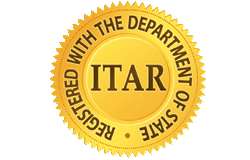 Outdoor, aerial, and direct burial construction may be required when running cable through various outdoor environments. A pulling eye is an "easy pull" ring that is attached to the end of the cable to prevent damage during installation. During installation the pulling force is redirected to the body of the cable instead of the core or connectors. This reduces the stress, and therefore damage, to the fibers. The pulling eye may be removed and reused.